Leading paediatric endinocronology Professor Robert Lustig has called on the government to act against high sugar content in food after outlining how it resembles alcohol's effects on the brain resulting in "a vicious cycle of consumption and disease". Speaking at the FAB Research Conference - Sugar, Fat, Food & Addiction, last week [10 July] Prof Lustig highlighted studies showing that sugar has a specific effect on the brain's 'reward system' resulting in a cycle of over-consumption, insulin resistance and hypertriglyceridemia. The University of California Professor told delegates: "The obesity epidemic is no doubt being fuelled by a secular trend in caloric excess. However, humans have a biochemical negative feedback mechanism called leptin which should prevent this continued over-consumption of high-calorie foods. Yet, given the huge rise in processed food consumption globally, even in low-income countries, over the past 30 years something is interupting the leptin negative feedback pathway." Leptin performs two function in the brain to reduce food intake - stimulating the melanocortin system to decrease calorie consumption and increase energy expenditure and, more importantly, reducing dopamine neurotransmission in the ventral tegmental area (VTA) to extinguish the reward signal when people are full. As such, Prof Lustig said that "dopamine & stress major drivers to the 'hunger illusion' which encourages young people in particular to continue to want to eat even after a meal. "When leptin levels fall, the hypothalamus senses starvation, and the VTA increases the reward of food, thereby encouraging increased consumption, In obesity, defective leptin action occurs through two mechanisms," Prof Lustig explained. "First, leptin transport across the blood-brain barrier is impaired. This is likely mediated through hypertriglyceridemia, a common manifestation of insulin resistance. Second, central leptin signal transduction is impaired, both at the hypothalamus, and the VTA. "This may be mediated through hyperinsulinemia with reduction in the condition not only promoting weight loss but also altering macronutrient food preference thus reducing carbohydrate intake. One possible proximate cause of both these indirect mechanisms of leptin resistance is the rise in fructose [sugar] consumption, which includes hypertriglyceridemia and hepatic insulin resistance." 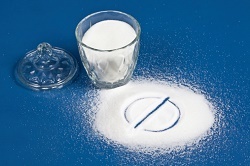 Further reading: Are top government nutrition advisers 'addicted to sugar'? Highlighting the effectiveness of combining public policy and education to combat over-consumption of other substances that stimulate the reward pathway, such as nicotine and alcohol, Prof Lustig called on health professionals to work with and encourage the government to make more explicit to families the risks of high-fructose foods. He concluded: "It's clear that obesity and drug addiction exhibit similar effects on dopamine neurotransmission, pharmacology and neuroimaging. If we look at the four main food 'triggers' for obesity: salt is habituating but not addictive; fat leads to bingeing but also isn't addictive; caffeine is a model drug for dependence; and while sugar [fructose] is still not scientifically irrefutably as addictive there's no question that it's abused in most 21st century diets and a major education and public health approach is urgently needed to curb it."